Like many of you I have been run off my feet in the last few months. With work & family demands tearing me at the seams and often making me feel frustrated that one or the other has to give, at times I lack time and energy to workout daily for longer than ten minutes and eat my lunch on the move or while working at my desk. Add to that late nights and the body rightfully starts to rebel. That’s when a good supplement plan comes into play and I am grateful to Charlotte Fraser, who while wearing a PR hat, also happens to be a mother, who can relate to pressures those of us who balance family and work face daily, and is a qualified nutritionist as well. First, she recommended Cytoplan supplements to me (my daughter is already huge fan of Cytoplan’s Nutribears, about which I wrote here and which thus far allowed her not to succumb to colds & viruses of the cold months), while also helpfully making some suggestions based on my lifestyle choices. Luckily for me, I was also guided by Cytoplan founder/managing director & registered nutritional therapist Amanda Williams and now I can share with you my Cytoplan supplements journey of the last few months. The fact that I am still standing after very busy and festive December and haven’t succumbed to colds and flu that have been making rounds is the testament that supplements, chosen with intention and knowledge, can help make up for our personal shortcomings when it comes to diet & lifestyle. Cytoplan takes nutritional advice very seriously, so if you want to have ‘personalised’ supplement recommendation, you need to fill their comprehensive questionnaire online, which takes into account your medical history, lifestyle, hormones & emotional problems you might be going through among other things. To be honest I ‘chickened out’ of doing it, as it is quite lengthy & does take time to complete it (being thorough when it comes to choosing supplements is a very good idea and the fact that Cytoplan offers this for free is a testament to how seriously they take their clients wellbeing), but Charlotte kindly acted as my nutritional fairy and based on the things that I told her, she recommended some Cytoplan supplements to me in early autumn ( I am sorry to say I am not a fan of Krill oil but take BareBiology fish oil (liquid or in capsule) daily), as in her opinion ‘they represent the different aspects of the range, but are also good for skin health at this particular time of year. Vitamin D is, of course, the one that you should also consider as that is one of the most common deficiencies come the shorter days – however, you can also get that from natural food sources’. (Galina’s note: I use ‘Better You’ Vitamin D spray daily from October onwards, both for myself, as well as for my children, as the brand makes it for adults, babies and kids. My spray provides me with 1000 IU in one spray, but if your blood test shows you are low on it, based on your doctor’s or registered nutritionist advice, you can increase it to 3,000 IU in dark autumn and winter months, when we feel the lack of sunshine quite acutely). Now, apart from Vitamin D & BareBiology, I stopped taking any other supplements from October, so I can see & feel how my body responds to Cytoplan. I put three to the test, Super B Extra, Wholefood Zinc & Cherry C & throughout the post added advice & comments from both Amanda & Charlotte, to give you a well-rounded view of my experience. Charlotte Fraser: ‘One of my personal favourites, and a popular one amongst my nutrition clients. I take two at breakfast, but if I am dog-tired or jet–lagged, I might take two at lunch too. These are brilliant for revving up your energy, but also keeping you super chilled – wonderfully supportive to the nervous system. Of course they are also very good for skin health too. You can’t store B vitamins in the body, so you will urinate out any excess. Super B Extra is fast acting and it contains good levels of magnesium as well to combat stress and help relax muscles. B vitamins are great for also making the glass half full – I think of B for ‘bounce :)’. Charlotte Fraser: ‘This is made from hydroponically-grown brassica (a member of the broccoli family). Zinc is a hugely important mineral and one that I find a lot of clients are deficient in. It is a particularly good idea to top up Zinc levels in the Autumn months, more as an insurance measure. It is of course the ‘vanity’ mineral, great for skin, hair and nails, however it is super important for helping to maintain optimum gut health, boosting the immune system, maintaining hormonal balance, growth, libido, brain function & helping to combat depression – the list is too long to mention. Everyone can benefit from some additional zinc in the lead up to Christmas when the bugs are flying, just to bolster one’s immune system. The best time to take Zinc is supper time. If you don’t like the capsule wholefood format, Cytoplan do a Food State variety called Zinc & Copper, which is nice too. 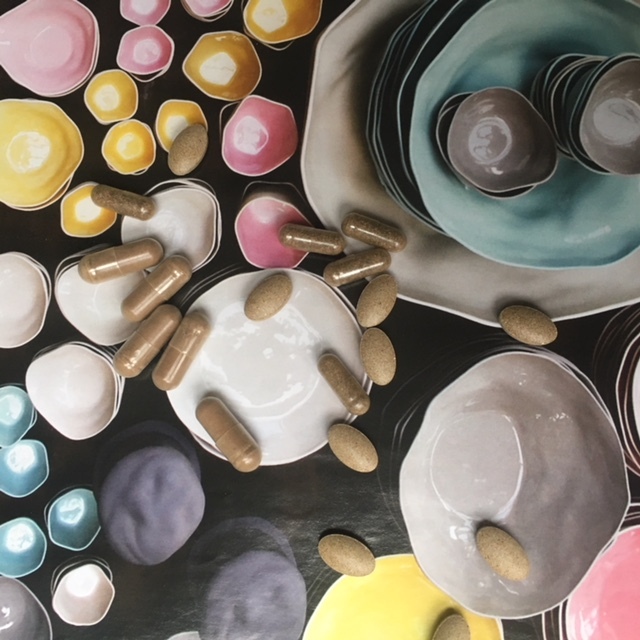 Following Charlotte’s advice I have been taking one capsule of zinc in the evening, after dinner and just as Charlotte described, gradually, within a few weeks, I find myself calmer and not as fussed compared to let’s say the run up to Christmas last year. Yes, there were the usual jitters along the line ‘how will I get everything done on time’, but I kept my head on, genuinely smiled outward and just got on with the ticking of the items of my daily ‘to do list’. Now, as we dive into January, after various indulgence and family travels, I feel like a better version of myself, ready to tackle the excitement and work projects that lie ahead. After reading Charlotte’s e-mail about this supplement I became particularly intrigued and as fate would have it, I had plenty of opportunities to really put it ‘to the test’. With cold and coughs, sore throats, stomach bugs and flu in schools and offices, every time I felt I wasn’t feeling as sparkly, I remembered Charlotte’s recommendations and took an extra capsule a day, instead of my one in the morning. And you know what? I didn’t get those colds and my inkling of a sore throat actually went away without me doing anything other than an extra Cherry C capsule and more green and herbal teas during the day. As part of my research about Cytoplan I also got to exchange e-mails with Amanda Williams, founder of Cytoplan, who has more than twenty years of experience in the industry. I agree with her that there are plenty of good nutritionists out there now, on whom you can rely for sensible & knowledgable, as well as personal advice. Unfortunately there are also plenty of people who dispense nutritional advice, as well as sell you supplements without having the necessary qualification and the concerning thing is that some of those people build up large followings. So my personal advice to you is to check what qualifications a nutritionist has, before taking advice on board. Luckily, as Amanda pointed out, ‘BANT is very active and nutrition is regulated’. But that doesn’t mean that you shouldn’t do a preliminary check. Cytoplan also works with a DNA testing company called iamYiam (I wrote about them last year here, ), so if you have your DNA test results and know your nutritional ‘shortcomings’, you can make sure that you take the right supplements alongside your daily food and drinks in order to give your body the best support for functioning at its peak. I also took the opportunity to ask Amanda what makes Cytoplan different from other supplement brands that seem to be mushrooming lately online, as well as on the shelves of retailers. Something that you might enjoy taking this year might all of a sudden not be available anymore, giving rise to celebrity endorsed brands or brands that are here for the short, not long-term gains thanks to increased consumer interest in wellbeing, nutrition and supplements. So, what makes Cytoplan different? 1) We always use the most bioeffective nutrient sources – most of these are wholefood, made through a unique growth process, and the others are part metabolized where this is necessary for some optimum bioefficacy in some nutrient forms. 2) Our products are designed to Bridge the Nutrition Gap, which means that the levels will always be effective, as well as safe. 3) We are wholly owned by a charitable foundation and all our profits go to charities working with nutrition globally. This means we can always do what we believe is right and are not driven by commercial pressures. We also source the ingredients globally from where each is the best of its kind. ‘The reality is that it is quite difficult (not impossible) to get all the nutrients needed for health from food alone, so it it’s a good insurance policy and very safe to take a well formulated multivitamin and mineral formula – particularly one that has been designed to make up for shortfalls that are prevalent in the diet of people in the western world (Nutrition Gap). Galina: You make a very strong case about Nutrition gap ( as well as the doses), the fact that people are starting to take whole food groups out for no medical reason – protein-free, sugar-free, gluten-free, in addition to erosion of nutrients that we consume daily through our food puts our bodies in more vulnerable positions. What worries me as a mother is the effect of modern food scene & growing restrictions thanks to marketing & influencers on the bodies (including hormones) & minds of the young generation, as well as ours. Is there general advice that you as nutritionist can give to women in terms of supplements? Are there specific supplements, like a multivitamin or books that you would recommend, so an average woman can make better decisions when it comes to supplements? What’s your opinion of adaptogens, as well as supplements like Chlorella, Maca, Baobab etc. Celebrity supplements? Medicinal mushrooms? Do we need to adapt supplements we take, as seasons change? Amanda: It is true that many people do remove whole food groups, like sugar or gluten and there may not be a diagnosed ‘medical’ reason for doing this. However, there is lots of research showing the problems caused by sugar and (for some people) gluten, which in fact can be linked to many non-gut related issues. For example, a condition referred to as ‘non-coeliac gluten sensitivity’ may be accompanied by neurological symptoms (depression, anxiety, headaches, dementia, ataxia), gut symptoms or other inflammatory conditions (eg arthritis). Unfortunately the medical tests available via the NHS often ‘miss’ many people who are reacting to gluten and the gold standard is an elimination diet for a period of time, at least 1 month, ideally 3 months. During this time symptoms are monitored and also checked when gluten is reintroduced. Of concern is that when people remove gluten containing foods they may substitute it with lots of ‘gluten-free’ foods and these are highly processed and lacking in nutrients. In addition, wheat provides over 70% of our intake of fibre and this needs to be replaced by eating more vegetables, fruits, nuts and seeds. Eating as close to possible to how our ancestors ate 10.000+ years ago is ideal – basing meals on vegetables with fruit, nuts/seeds, good oils and small amounts of lean meat (preferably organic) is ideal. The message is quite confused in the media however – with low carb, low or high fat, low or high protein. For women, we do have supplements to support different life stages. For example ‘pre-menopause’, our multi formula, contains iron; for post menopausal women we have increased the dose of certain nutrients and reduced the amount of iron, as this is no longer being lost by menstruation. We usually recommend a multi as a ‘foundation’. Many people will also benefit from a fish oil supplement, in particular if oily fish is not eaten regularly (and eating large quantities of oily fish may not be recommended during the fertile years due to heavy metal contamination). Other supplements that may be recommended will depend on the person, but for example evening primrose oil and extra vitamin B6 can be useful for some women to support hormone balance. Adaptogens may be useful, particularly during stressful periods or perimenopause/postmenopause eg Ashwagandha, Gingseng, Maca. They can help with hormone balancing and adrenal support. During menopause for example the adrenals are responsible for much of our oestrogen production and if there is significant stress, menopausal symptoms may be worse due to the adrenals having to produce cortisol and other stress hormones at the expense of oestrogen. Chlorella and medicinal mushrooms both have their place as well. Chlorella can be taken for short periods to support detoxification processes. We do not have any products containing it, but I wouldn’t recommend ongoing, long periods. With regard to adapting supplements according to the seasons, it’s a good question, certainly in winter some people may feel they want to hibernate, so extra B vitamins or adrenal support may be useful. In addition everyone should be taking vitamin D, as part of a multivitamin/mineral and for some people extra will be needed over the winter. Other extra immune support may be beneficial eg beta glucans which have been shown in research to have a positive benefit on the immune system (they are one of the actives in medicinal mushrooms). Galina: How often do you write blogs (I love not only reading them during my moments of ‘me time’, but learning facts about nutrition and how it affects our bodies and minds) and how active are you on social media? Apart from selling your products via your website, working with Lorena (founder of iamYiam) and nutritionists, why do you chose such formula of distribution and not through retailers shelves? Amanda: We publish blogs weekly and our market is through practitioners, doctors, dentists and other therapists. We have another Brand (Natures Own) which is a retail brand. Galina: Thank you for sharing advice on supplements in the colder months, I wonder if beta glucans offer an additional layer of protecting the body against flu? The subject seems to have risen its head in the news again and I was recently ‘told off’ by one of the mums I know when I declined a school vaccination for my daughter against flu. I said to her that flu vaccines don’t necessarily protect your body from flu, as every year we have different strains, which can’t be predicted in advance, hence vaccinations might not be the most effective solution to the problem in general (I am not talking about people with immunity or serious health issues here). She told me that by declining it I am jeopardising my daughter’s health, as well as the other children in the school…..
Amanda: 1/3 1/6 Beta Glucan will certainly protect from flu and other viruses and non specific bacterial infections. It optimizes function of the immune system and as long as taken regularly, will offer really good protection. I am not a fan of vaccines (except for immune compromised groups for whom the risk of flu is life threatening) – because flu viruses change with every outbreak and vaccines are hence never specific to the strain that is circulating. The best protection was can have is an optimally function immune system which protects us against almost all threats. Thanks to both Amanda & Charlotte I not only got to expand my existing knowledge when it comes to supplements, I also took the time to sit down and contemplate the need to supplement our daily food intake. Some of us manage to achieve a perfect balance of variety and nutrients, but overall I think we all can improve the way we eat & digest our food. Ultimately our bodies deserve utmost respect for what they help us achieve daily, so the least we can do is look after it with love and due care. Regular exercise that you actually enjoy doing, eating freshly-made meals, preferably made with ingredients that are in season, restful and rejuvenating sleep, not overreacting to things or people are simple enough things to do. Apply the same approach to choosing your supplements & make sure you take nutritional advice from those who are actually qualified to give it.